Winner has been contacted and responded. The winner is Kim Stone. I am so excited to team up with some amazing bloggers to bring to you the Ultimate Kitchen Giveaway! You get to choose the color of a brand new KitchenAid Mixer and you will also receive an ice cream maker to help stay cool for the summer! 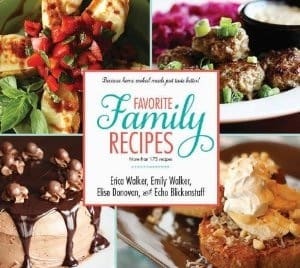 We are also including an amazing cookbook from Favorite Family Recipes that you are going to love! Thank you for all the new pins for Pinterest! Searching for pins does not find all these wonderful gems that are listed above. I am finishing up here because something caught my eye on one of the sites for tonight's dinner! I have always wanted a mixer from Kitchenaid!!! And to top it off an ice cream maker!!! Ahhhh!!! Pick me pick me!!! I will put both to good use!!! Would love to have one of these Kitchenaid mixer and ice cream maker! Awesome prizes. Thanks for the giveaway. Good luck everyone! Thank you so much for the opportunity to win, I have always wanted a Kitchen Aid mixer:) I love your blogs! Awesome give and great new pins!!! I have 7 kiddos, so I could definitely put both of these to good use! Your comment caught my eye! I have seven kids, too!! These appliances would be great, huh?! Yay! I think I did all the steps! Love the yellow color for the mixer and ice cream maker. Fun! Wow what a fun giveaway! Cooking could be made a lot easier and more fun with one of each of theses! I would love the opportunity to win! This is amazing! Thanks for the giveaway. Oh and I would choose the orange one. What a fun give away!! I would love a navy KitchenAid and a yellow ice cream maker sitting on my countertop!! Love all the colors! Awesome prizes!! Love Kitchenaid! I've always wanted one of these-would so inspire me to bake more!! Would so love a mixer and an ice cream maker!!! My daughter is getting married this weekend and this would be a perfect gift for her!!! I love all the colors. I would love one of these mixers. And an ice cream maker?!?! That would make Florida feel so much cooler! Thank you for the giveaway...would LOVE one of these. this was a confusing entry. after following all those pinterest. that rafflecopter just wanted to sign us up for using their site to put raffles on our site. it doesnt say if our entry was submitted or not, after following everyone. not explanatory enough. winning a kitchenaid mixer and oh boy an ice cream maker too, would be a real blessing. i can only hope and pray for a win! thanks for the opportunity. Great giveaway! I looooove yellow!